The #1 destination on every dive travelers’ bucket-list. Home to Jellyfish Lake & many of the world’s top dive sites. 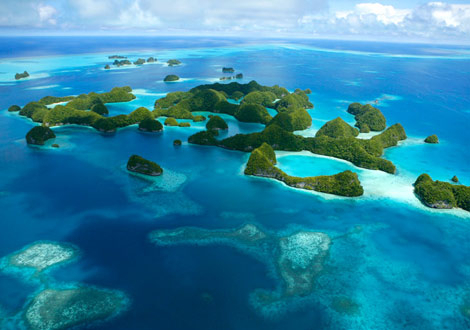 In 2009 Palau led the world in shark conservation, becoming the first ever Shark Sanctuary. Contact our Travel Gurus or get started by building your own travel package. Palau is a world class dive destination chosen by the National Geographic Society as the first Underwater Wonder of the World. Fed by three major converging ocean currents, Palau is home to more species of marine life than any other area of similar size in the world. 350 islands and atolls host 1,300 species of fish, over 700 species of coral and more unique species than anywhere else on earth. Palau’s oceans are known world-wide for their abundance of large pelagic animals and other incredible underwater lifeforms, including giant 500-pound clams, dugongs and a lake filled with millions of sting-less jellyfish. Palau is an amazing destination for divers and snorkelers alike. Divers will experience some of the world’s best-known dive sites, including walls, wrecks, reefs, caves, blue holes, and incredible drift diving. For non-divers, kayak and snorkeling tours of the legendary Rock Islands are as awe-inspiring as Palau’s world class dive sites. United Airlines offers a flight to and from Palau 6 days a week. Mon-Fri: flights depart around 7-8pm. Sun: flights depart around 10pm. Mon-Sat: flights depart Palau around 2-3am and arrive to Guam around 5-6am. Diving – Palau is an amazing destination for big animals. Sharks, turtles, and large fish can be seen on nearly every dive. Rays are also common. Environmental conservation efforts have kept Palau’s marine life and corals healthy and thriving. Dive sites are incredibly varied with coral covered walls, unique drift diving, channels, tunnels, and beautiful blue hole caverns. See videos of Palau’s Unique Dive Expeditions. Kayak tours – Bring your snorkel gear and a waterproof camera and get ready for an amazing adverture through Palau’s beautiful Rock Islands. Kayak tours include a knowledgeable guide, multiple stops to snorkel and visits to hidden coves and other areas not accessible by boat. Peleliu – About an hour and a half by boat south of Koror, Peleliu is very near to many of Palau’s best dive sites and also rich with WWII history. (Read about the Battle of Peleliu for more info). Due to the long boat trip a group of at least 4 people is required to visit Peleliu as a day tour; alternatively, it is possible to book accommodations and base your dive trip out of this southern island, putting you closer to famous sites like Blue Corner, Blue Holes and German Channel. Low: Best availability for hotels and generally lower rates. Some hotels do have short seasons within this time of the year. High: Rates are higher, availability is limited. Book a couple of months in advance for a better chance of availability. Peak: For the best chance of availability in your hotel or resort of choice, make your booking no later than August. Beyond that time, expect vacancies to fill quickly. Weather: Palau doesn’t have a dramatic foul-weather season to avoid. Required for diving and all other water activities. Costs are per person (Ages 7 & up), permits valid for 10 days. Costs are per person (Ages 6 & up), permits valid for 10 days. Tour operators may charge a processing fee for permits and/or a surcharge for payment by credit card. Palau no longer has a fee required upon departure from the airport. Starting Jan 1, 2018, departure taxes are now included in the cost of airfare.